As an undergraduate majoring in environmental sciences, Tess Harper didn’t have a strong background in computer science when she began her ten-week Data+ summer project. Neither did her teammate, Molly Rosenstein. Their mission was to develop interactive data applications for use in Environmental Science 101, a Duke course taught by Rebecca Vidra. 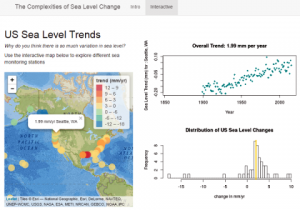 Through the mentorship of doctoral students Matt Ross and Aaron Berdanier, Harper and Rosenstein were able to create six web-based apps exploring climate change, sea level rise, biodiversity, solar power, watershed hydrology, and mountaintop mining. Ross has accepted a position as Assistant Professor of Ecosystem Science and Sustainability at Colorado State University. Below, he shares the role Data+ played in his journey as a scholar and mentor. I came to Duke to work with Emily and Martin because they are both experts in developing science to better understand how people reshape, restore, and alter ecosystems, specifically rivers and streams. As an undergraduate at CU Boulder, I was always interested in better understanding how these novel ecosystems–that mankind intentionally and unintentionally creates–work, and Emily and Martin provided an excellent environment to work on these ideas. I eventually ended up studying the impacts of mountaintop mining for coal, working in some of the most altered ecosystems in the world, where hundreds of meters of bedrock are removed to access shallow coal seams, before rebuilding landscapes from the rubble piles that remain once mining operations cease. This work was done with Emily, Dr. Brian McGlynn (another one of my advisers) and Fabian Nippgen (a post-doc mentor). The approach we used to better understand these man-made ecosystems was extremely data rich with geospatial data, sensor data, hydrologic, and biogeochemical data. However, when I started graduate school I had zero experience working with data, programming, statistics or really any practical knowledge of analyzing data, especially such complex streams of data. As I worked through graduate school, I developed a passion for programming fostered by friendships with incredibly talented friends and coding mentors (specifically Kris Voss, Matt Kwit, and Aaron Berdanier). Aaron Berdanier, a previous Ph.D. student in Jim Clark’s lab, told me about a Data+ project he had received funding for and asked if I wanted to join. 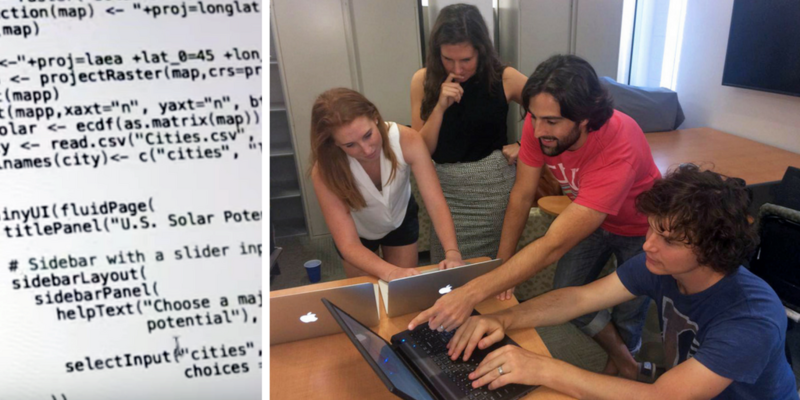 At the time, I was grappling with how to visualize and share the complex datasets from my Ph.D. and I knew Aaron wanted to teach undergraduates how to use Shiny R (a platform for visualizing and sharing interactive data), so I enthusiastically joined. Aaron and I ended up spending a significant portion of our summer working with Molly Rosenstein and Tess Harper on a variety of visualizations for an introductory environmental science course taught by Dr. Rebecca Vidra (see the final website). Molly and Tess are very talented and picked up programming super fast, and it was really inspiring to be around such smart and dedicated people. Aaron was really the lead on the project, but we both learned a lot that summer, and afterwards we both became strong advocates for data visualization using Shiny R. We ended up teaching seminars to the Data Viz lab, Nicholas School, Data+ and others based on our experience teaching Molly and Tess. The central lesson from this experience was that programming and data visualization can be approachable and rapidly incorporated into any research approach. These positive experiences led me to be a part of another Data+ project in the summer of 2017 with Richard Marinos as the lead. 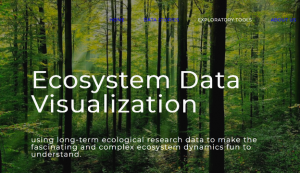 As with the first project, we worked with an incredibly talented group of undergraduates (Annie Lott, Camilla Vargas, and Devri Adams), and produced a website visualizing long-term ecosystem datasets. All in all, my experience with Data+ made me realize how rapidly students can learn intimidating skills (programming, statistics, data analysis) with significant motivation (summer job) and consistent mentoring. All of our undergraduate students, for both years, had little experience with programming before our projects and within 10 weeks had made complex, interesting, and beautiful data visualizations that tell important environmental stories. I think any environmental scientist–undergraduate, graduate, faculty, or otherwise–can use these powerful tools to tell compelling stories about our work. I took this passion for data and data visualization to my first faculty interview at Colorado State University for a position as a professor of water quality. 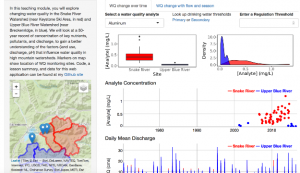 During my interview I used a Shiny R app to teach students about water quality in Colorado. It was a gratifying experience to see students’ enthusiasm not just for the subject material, but also for how one could produce these kinds of visualizations. Without Data+ I likely would not have had the confidence to use Shiny R in my teaching interview. Furthermore, I know it was important to the interviewing committee that I had 20 weeks of dedicated mentorship experience with undergraduates. Together these influences of Data+ helped me land the position at CSU where I will start next year. There, I will continue to work on issues around water quality, but also share my passion for data science and visualization. See all Bass Connections summer programs. 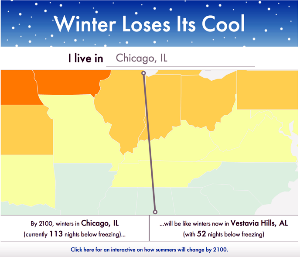 Read Students Bring Sixty Years of Data to Life on the Web on the Duke Research blog. Watch a video about Ross’s second Data+ team.